Two hours sleep before a big trip… what was I thinking? It had been Jamie and Flo’s wedding; an event we didn’t want to miss. So we went to the reception at Fort William, offered our congratulations and then left for Loch Insh from where we were going to start our journey. We set off at 04:00 on Sunday morning and headed into River Spey aboard our trusty 17’ Penobscot, loaded with Solway Dory expedition sailing rigs, camping gear and enough food for 5 days. The concept of the trip was borne in a conversation 12 months previously when Ray Goodwin spoke of doing the Spey in a Day and the Caledonian Canal in a day. Inspired by this I studied the relevant maps and charts and reckoned that the 50 mile ‘Missing Link’ along the Moray Firth was doable in a day. The whole trip, 174 miles, in 3 days! As with all big adventures this relied on favourable weather, a good partner and desire. On Sunday 29th May 2016 all 3 were present as we set off. Weather was good with gradually increasing Northerly Winds forecast, my partner was Davis (The Machine) Gould-Duff. As for desire… we knew that physically this would be a journey into the unknown – this is how we like it. I should mention my wife, Katrina, at this point who was going to follow our progress using our Spot Messenger, and get to various points along the way, not to carry kit or support us in any way, but to take photos. Words can’t describe the beauty of the Spey. It is simply stunning. The scenery is World Class. Wildlife abounds and on a Sunday there are no anglers! Although paddling with the flow it was hot, hard work. Dry suits were not ideal but I didn’t want to get wet, and being only Davis’s second venture onto moving water in an open canoe (and I’m not the best white water paddler), we couldn’t guarantee a dry passage. As it happened we were absolutely fine and really enjoyed the lower rapids. As we approached Spey Bay it had cooled down considerably. It was 7 pm. We rigged the boat for sailing then Davis set up the tarp while I cooked tea, after which, at 9pm we got in our sleeping bags, tired but happy. We awoke just 3 hours later in order to catch a fair tide. I was nervous as we paddled out into the pitch black Moray Firth at 1am. I had not been in this stretch of water before and wasn’t sure how big the swell would be. The air was murky and damp with very little wind so we paddle sailed. The swell was fine but we could hear the waves breaking on the shore. In the distance were the lights of Lossiemouth. The wind remained very light as we paddle sailed towards Burghead where we waved to Katrina who had spent the night there and got up early to see us pass. We continued paddle sailing until we landed on the beach at the mouth of the Findhorn at 8am. Progress had been slower than we’d hoped due to lighter than forecast winds, but the tide had turned against us and we had to wait for it to turn again at 1pm. We boiled some water and filled our flasks before crawling into our sleeping bags for a couple of hours much needed sleep, while the seals basked in the sun on the other side of the river mouth. We headed into the shallow waters hoping the wind would have picked up. It hadn’t. It was hot! We paddled. Tired, I sympathised with the sailors caught in the doldrums. Progress was slow. We kept paddling. I was concerned that if we did not make Inverness by 7pm we would be paddling against the tide. It was a neap tide that day, but the tidal flow as you approach Inverness is strong and I wasn’t sure we would be able to paddle against it. With 10 miles to go the tide turned against us once more, but the wind picked up. We paddle sailed past Fort George and towards the bridge of the A9 at Inverness. Davis learnt a new trick of surfing and we paddled like demons to match the speed of the waves that were coming up from behind. Eventually, at around 8pm, we reached the entrance to the Caledonian Canal. We portaged past the lock gates and over the railway line then stopped to set up camp. As you can see, Davis and I had been practicing our bushcraft skills and knocked up this little table! Day 3 dawned at 4am. I confess, that at this stage I was happy to allow Katrina to make our oatmeal and fill our flasks. 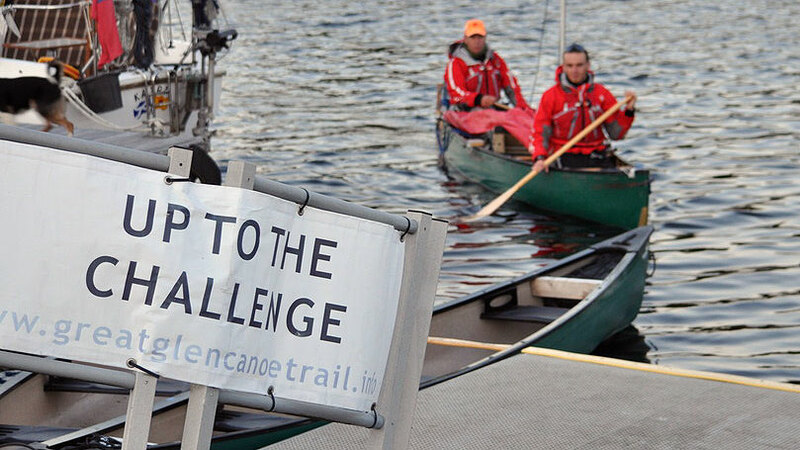 After a quick breakfast we set off paddling down the Caledonian Canal towards Loch Ness. I had told Davis that it was custom that anyone on Loch Ness for the first time must wear a Loch Ness Monster hat. So he did. I also warned him to be vigilant as it was rumoured Nessie may be on heat and try to hump him! We had our sails up, but the slight breeze on the loch didn’t help much as we continued paddling but, thankfully, 5 miles from Fort Augustus it picked up. We continued on, in the main paddle sailing, along the Canal and Loch Oich to Laggan Locks where we saw Katrina again with her camera. Then we got onto Loch Lochy which is where things got interesting! The wind really picked up from a nice F3-4 to at least a F6! We were in danger of broaching as we surfed large waves. In Davis’s own words, it was a “white knuckle ride”. At one point the bow dug in and we took on a lot of water. I was tired and was finding the sailing too difficult. We had been sailing with a 35sq ft main sail and a 14sq ft mizzen. We stopped, took the mizzen down, and moved the position of the main sail. We carried on, but it was still difficult sailing. We stopped again and changed the sail so that we were just using the 14sq ft sail as a main sail. There was a good 3-foot swell and even with this much smaller sail it was hard. The photos don’t do this stretch justice. Finally, we arrived at Gairlochy with the majestic Ben Nevis overseeing our efforts. The final 6 Miles paddle sailing down the Canal was easy. We landed at the top of Neptunes Staircase in Banavie, exhausted, at 9.55pm as the setting sun was casting an orange hue over Ben Nevis. So in 3 days we had paddled down gentle rivers, through rapids and into the sea. We kept going when it got tough and the wind didn’t materialise. We surfed waves, paddled lochs amongst monsters and along beautiful canals in the presence of majestic mountains. We were accompanied by jumping salmon, eagles, dolphins and seals. We had fulfilled our ambition and completed The Missing Link.